Artist’s conception illustrates Kepler-22b, a planet known to comfortably circle in the habitable zone of a sun-like star. Image credit: NASA/Ames/JPL-Caltech. NASA’s Kepler mission has confirmed its first planet in the “habitable zone,” the region where liquid water could exist on a planet’s surface. Kepler also has discovered more than 1,000 new planet candidates, nearly doubling its previously known count. Ten of these candidates are near-Earth-size and orbit in the habitable zone of their host star. Candidates require follow-up observations to verify they are actual planets. The newly confirmed planet, Kepler-22b, is the smallest yet found to orbit in the middle of the habitable zone of a star similar to our sun. The planet is about 2.4 times the radius of Earth. Scientists don’t yet know if Kepler-22b has a predominantly rocky, gaseous or liquid composition, but its discovery is a step closer to finding Earth-like planets. Kepler discovers planets and planet candidates by measuring dips in the brightness of more than 150,000 stars to search for planets that cross in front, or “transit,” the stars. Kepler requires at least three transits to verify a signal as a planet. The Kepler spacecraft is an American space observatory, the space-based portion of NASA’s Kepler Mission to discover Earth-like planets orbiting other stars. The Kepler spacecraft is named in honor of the 17th-century German astronomer Johannes Kepler. The spacecraft was launched on March 7, 2009, with a planned mission lifetime of at least 3.5 years. 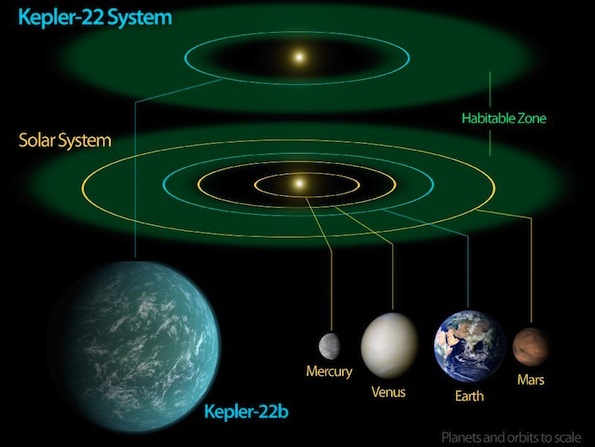 Diagram compares our own solar system to Kepler-22, a star system containing the first “habitable zone” planet discovered by NASA’s Kepler mission. Image credit: NASA/Ames/JPL-Caltech. 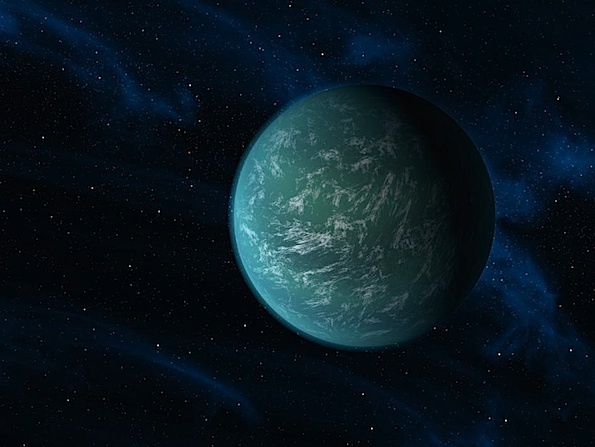 Kepler-22b is located 600 light-years away. While the planet is larger than Earth, its orbit of 290 days around a sun-like star resembles that of our world. The planet’s host star belongs to the same class as our sun, called G-type, although it is slightly smaller and cooler. There are 48 planet candidates in their star’s habitable zone. While this is a decrease from the 54 reported in February, the Kepler team has applied a stricter definition of what constitutes a habitable zone in the new catalog, to account for the warming effect of atmospheres, which would move the zone away from the star, out to longer orbital periods. NASA’s Ames Research Center manages Kepler’s ground system development, mission operations and science data analysis. NASA’s Jet Propulsion Laboratory in Pasadena, Calif., managed Kepler mission development. The Space Telescope Science Institute in Baltimore archives, hosts and distributes the Kepler science data. Kepler is NASA’s 10th Discovery Mission and is funded by NASA’s Science Mission Directorate at the agency’s headquarters.